Currently, over 300 citizens of India are students of Bogomolets National Medical University. Thus, first of all, Prof. D.K. Mitra visited the Dean’s office for training foreign students. There he met with the Dean Assoc. Prof. Volodymyr Sulik, First Deputy Dean Assoc. Prof. Tetiana Timokhina and Deputy Dean Tetiana Lakhtadyr. It is the Dean’s office where foreign students ask for assistance in solving various issues in study affairs, living in dormitory, migration issues etc. The Vice-Rector on scientific-pedagogical, medical work and postgraduate education, Professor Oleksandr Naumenko presented to Professor D. K. Mitra work process of Admission Board in NMU, also conducted a tour of morphological museum, lecture classrooms and told about significant historical moments in the history of the University. Deputy dean of the Faculty on training foreign citizens, Assistant professor of human anatomy, Tetiana Lakhtadyr demonstrated the unique exhibits of the anatomical Museum of the Bogomolets National Medical University. Due to the interest of All India Institute of Medical Sciences (AIIMS) in the implementation of future projects for interdisciplinary clinical collaboration on problems of different directions surgery of Bogomolets National Medical University, Professor D. K. Mitra met with the head of the Department of Surgery No. 4, Professor Volodymyr Mishalov. Scientists have shared development issues and advances in clinical and experimental work of both universities. They discussed a number of proposals for cooperation in the sphere of joint research projects and gaining new experience. Head of Surgery Department No. 4, Professor Volodymyr Mishalov spoke about the main areas of work at the Department, as well as the latest technology of cellular medicine, showed Department of general surgery and vascular surgery. In the company of Head of the Department of Infectious Diseases, Professor Olga Golubovska, the guest visited the Department of Infectious Diseases. Professor D. K. Mitra noted that the problem of spread of infectious diseases in India determines the direction of the fight with them as leading one. In the flow of the visit, Professor D. K. Mitra, who represents the All India Institute of Medical Sciences (AIIMS), met with the Vice-Rector for International Relations, Research and Education, Professor Olesia Lynovytska. The meeting was attended by the Professor of the Department of General Surgery No. 2 Mykola Stets, Deputy Dean of the Faculty on training foreign citizens, Assistant Professor Tetiana Timokhina, Deputy dean of the Faculty on training foreign citizens, Assistant Tetiana Lakhtadyr and the Head of the Department for International Cooperation Hanna Malunova. During the meeting both parties discussed the possibilities and forms of future cooperation between Bogomolets National Medical University and All India Institute of Medical Sciences. Due to the prospect of joint work between the Bogomolets National Medical University and All India Institute of Medical Sciences in the field of dentistry, Professor D. K. Mitra met with the Director of Dental Medical Center at NMU, Professor Andrii Kopchak and Deputy Director on health issues, Nina Hrol. Also parties discussed future horizons of cooperation, modern scientific achievements, as well as the level of professional publications, which covered the development and achievements of the scientific staff from departments of the Dental Faculty, the degree of availability of clinical, nursing and medical practice for students in Bogomolets National Medical University. Professor D. K. Mitra visited the Research institute of experimental and clinical medicine, about which the Director, Professor Larisa Natrus, conducted an excursion. The positive assessment of the Professor from the AIIMS, noted that the organization of scientific laboratories and equipment provides an opportunity for students to carry out measurements independently and clearly to get acquainted with techniques of patient laboratory study. 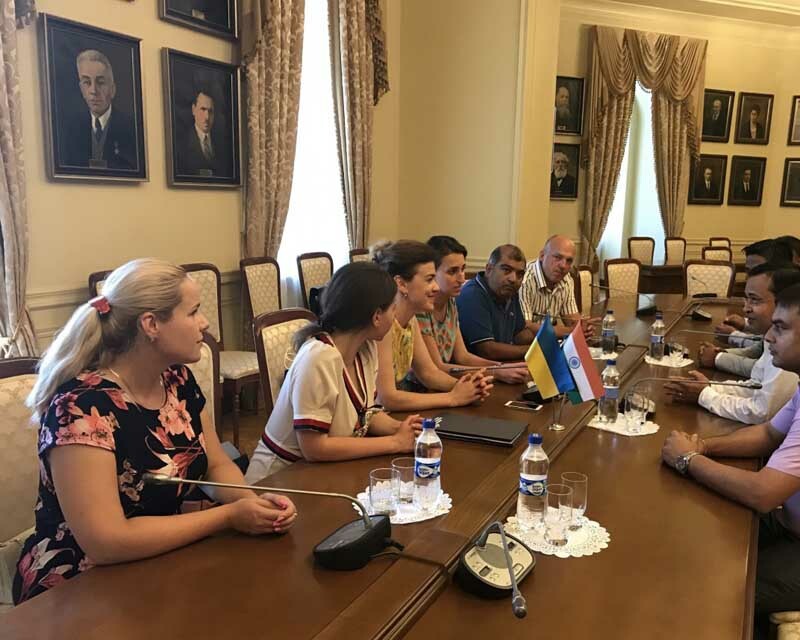 Together with the Head of the Department for Research Dr. Andrii Dinets, Professor D. K. Mitra discussed new strategic scientific directions of the Bogomolets National Medical University and plans for further interaction in scientific field. 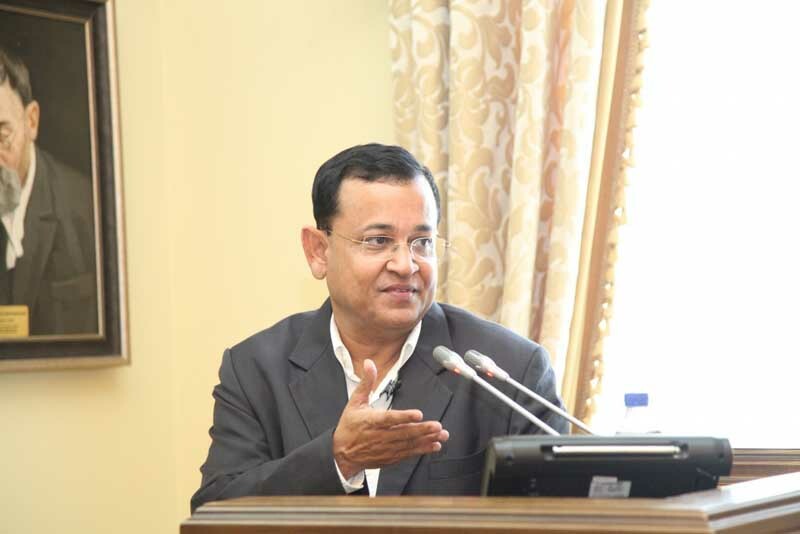 In conclusion of the visit to the Bogomolets National Medical University, Professor D. K. Mitra briefed the scientific community of the University on the structure of the All India Institute of Medical Sciences (AIIMS). All India Institute of Medical Sciences in New-Delhi, India was founded in 1956, and currently is the hospital complex university service more than 1.5 million outpatients and 80 thousand of stationary patients, perform more than 100 thousand surgeries per year, the University counts 46 departments. The Professor spoke about the activities of some medical centers and institutes that are subject to the AIIMS – Cardio-Thoracic Sciences Centre, Dr. Rajendra Prasad Centre for Ophtalmic Sciences, Dr. B.R.A Institute-Rotary Cancer Hospital, National Drug Dependence Treatment Center, Jai Prakash Narayan Apex Trauma Center. The guest gave answers to numerous questions from professors and associate professors from various departments, postgraduate students, clinical interns, students, and in the end the report, the scientist spoke about his own 12-year experience of work at Stanford University, California, United States.